$ In stock! Order now! Product description: 500ml Fabric Cleaner & 500ml Fabric Protector come in the special offer cleaning & protection kit from all fabrics, textile & cloth. Our Fabric Care Kit is Equipped to Clean and Remove Stains, Every Time. Fabric is one of those materials that just needs a little extra protection. Particularly when it comes to delicate fabrics, like wool or silk, we often can’t rely on our standard methods of care to ensure longevity from our fabric products. That’s where a complete solution like our Fabric Care Kit shows its value: it’s a kit that can do it all when it comes to sufficient fabric cleaning. A two-part fabric kit designed to clean and protect all fabric items - including carpet, upholstery, and clothes - our Fabric Care Kit is our customers’ top-rated choice for a comprehensive fabric solution. What’s Included in the Fabric Care Kit? 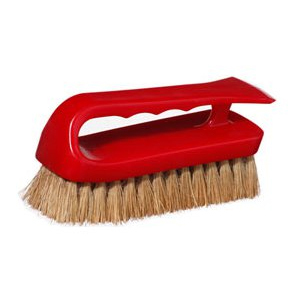 There’s a lot to love about this product, particularly if you’re a fan of all-in-one cleaning solutions. 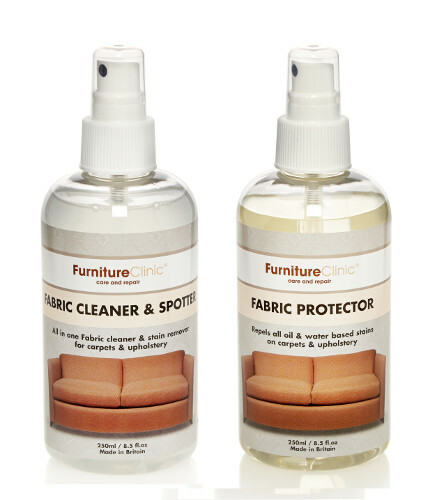 This product is as good at protecting your fabric from future stains as it is removing existing ones, and we’re all about the combination of being preventative AND proactive at Furniture Clinic. 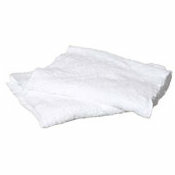 Our Fabric Cleaner and Spotter is made from plant extracts, which means it is non-hazardous and completely safe for use. When we say we believe in being preventative, there’s perhaps no better proof than our Fabric Protector. A product that repels all oil and water based stains from clothes, carpet, and upholstery, our Fabric Protector helps you refrain from the worry of handling stains in the future – they just won’t exist in the first place! How long will this product last? Well, with proper storage (in a cool place with the lid securely fastened) this product will last you up to five years! With consideration to coverage, one of these kits is enough product to thoroughly clean and protect an entire living room set, or an area of a carpet that’s roughly 200 square ft. in size ! Perhaps even more exciting than its coverage and shelf life is the ease in which it can arrive at your home. Our quick online ordering process is a no-hassle solution to getting the process started today, and our competitive pricing means that the Fabric Care Kit can be yours without going over budget. If you have any questions or are looking for additional recommendations from our team of experts, we always encourage you to give us a call or fill out our online contact form. We’re happy to help, and we’re excited to partner with you for your fabric care needs!